I have to say, this is definitely in the top 3 favorite projects I’ve done to a house. Relatively small cost and effort for a huge impact. 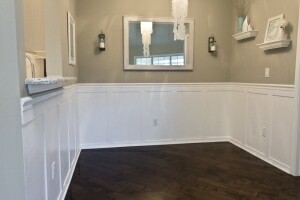 I had been wanting to do wainscoting forever, and our dining room was the perfect area to try it on. 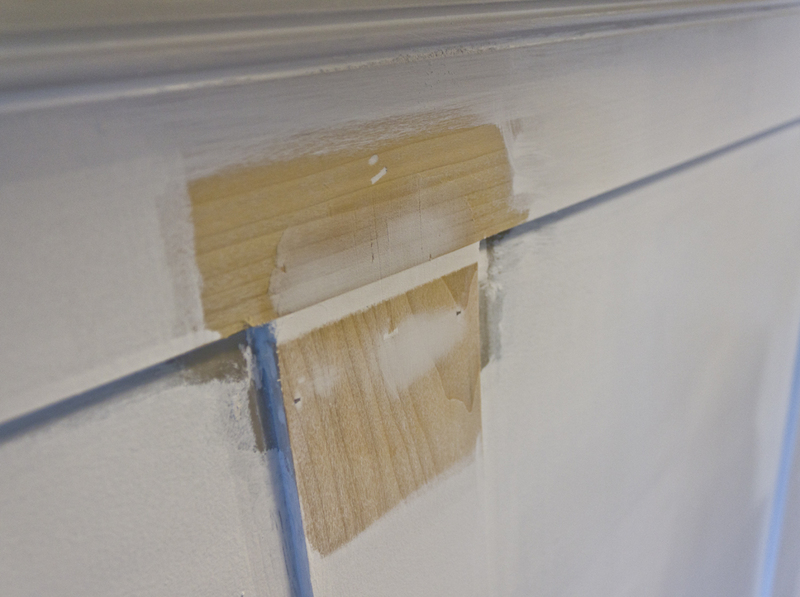 I was worried about how the boards would meet up with our baseboards, since it was only 1/4 ” thick, and I didn’t want to replace those and have them not match the rest of the house. Then I came across this tutorial and knew it was the perfect and easiest way to achieve the look. Since the boards were only 1/4″ thick they would line up perfectly with my existing baseboard. Problem solved! 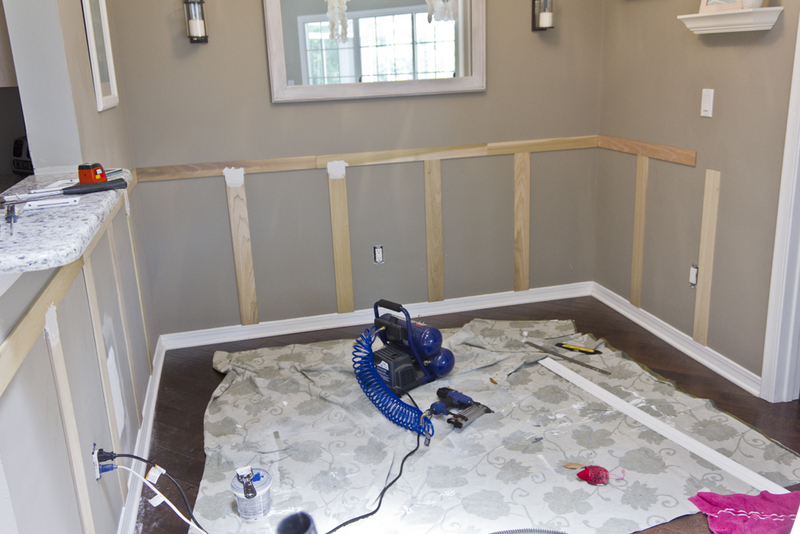 Then I would use the narrower poplar boards and run them horizontally across the wall on top of the vertical boards, then top that off with the trim. They came in quarter inch and half inch thick pieces, all 3 feet long, in various widths. In the tutorial I followed, she used the same 4″ thick (err 3.5″) pieces to run across the top, but I was worried it would look too thick with the chair rail so I opted for the 3″ (which is also actually 2.5″). FYI, they only had 7 of the narrower poplar boards left so we had to buy one oak in the same size. Ugh. Stay away from oak, it has horrible rough grain that you can see when you paint over it and it’s really hard to cover without turning yellow. Stick with poplar! After making all the straight cuts and miters (with only one small miter disaster that we later fixed with caulk) the boards were ready to go up! And board #1 is up! All that was left to do was caulk and spackle and paint! Which ended up taking 80% of our time. Luckily we were able to fill it and sand over it and you can’t really tell unless you’re looking for it. Here is the before before, as in when we bought the house…. Ahhh… worth every second of sanding and painting! Timewise, it took a couple hours to get the wood all cut and mounted, another few hours to caulk and sand at least, which carried over to the next day where it took a good half day to paint and put the final touches on. In hours I’d say we spent a good ten hours on the project (again, most of it spackling and sanding out the problem areas). Be back in a few days with another kitchen update! Just linked up with the DIY Showoff! Turned out great! Huge transformation. Love it, it looks great! Can't wait to see the dinning room all finished! That looks amazing, nice job! Wow – that is so effective!! I wanted to let you know that I just gave you the versatile blogger award! Feel free to check out my blog for more info about it. your tutorial is the best I am seen so far!! thanks!!! AND IT LOOKS GREAT!! Do you mind telling what kind of paint you used for it? What is the paint color for the top half? i love the job and the colour combo! but i'd love to see a pic with furniture in that room… or did i miss it… anyway, i find your blog very inspiring! Hi there! Thank you for the tutorial. I am following it for my kitchen, actually! 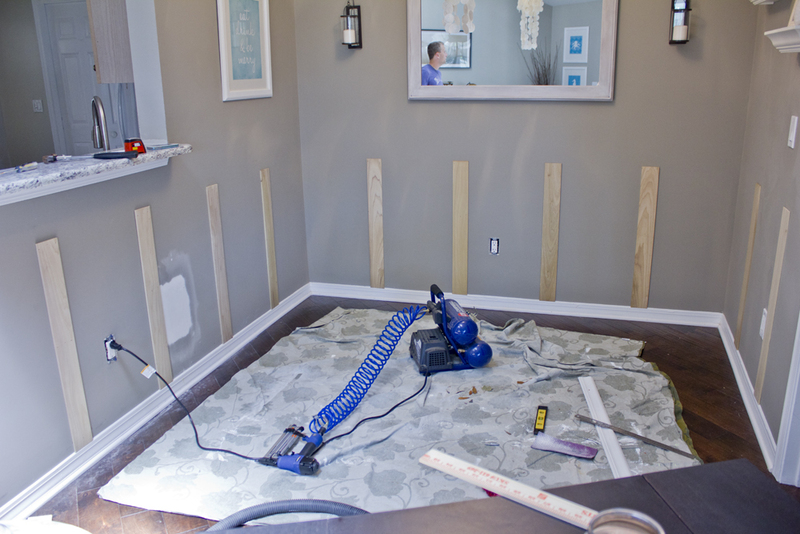 Quick question: Did you nail your vertical boards into studs in the walls? 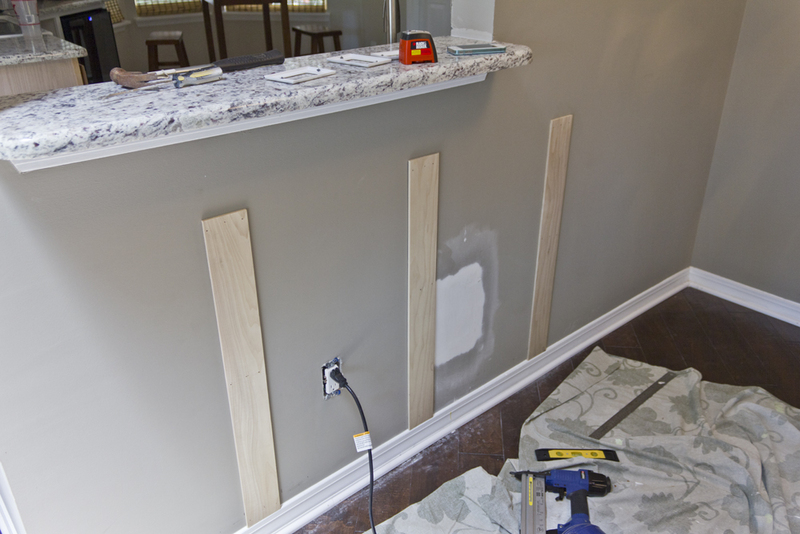 We have an older home with plaster walls, so I'm not sure if we need to do that or not. Any advice you could give would be much appreciated! Cheers! 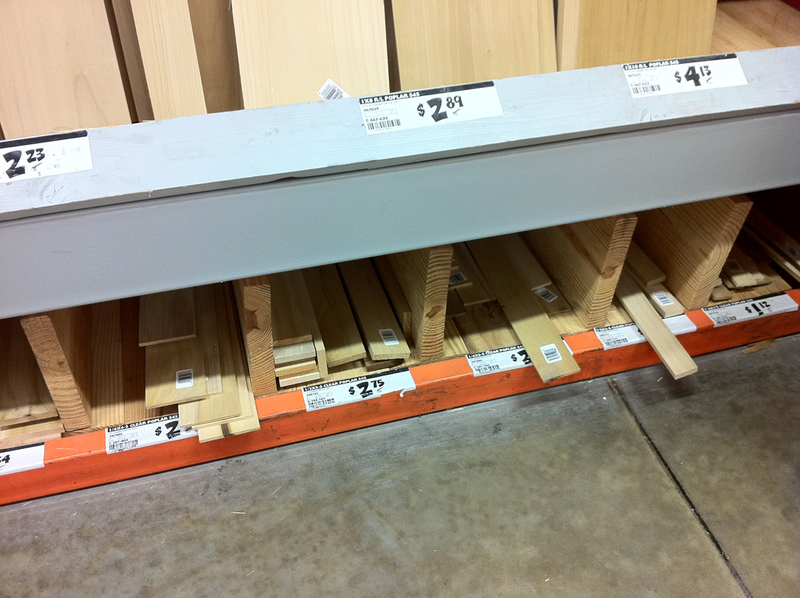 For those looking to do this, I'd suggest putting the top rail up first, then the bottom rail ensuring both are level. You can cut one stile to length to use as a guide for the placement of the bottom. 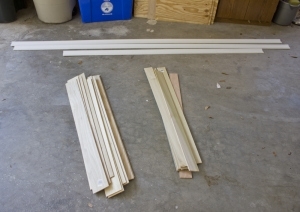 You can then use corner round or other trim on the baseboard to fill in the difference. It'll make the job of working with a non-level house much easier! Nope, we just nailed them right into the wall and they stay put just fine, especially with paint and caulk to seal them in. where do you buy your paint? I am looking at Lowe's and they don't have this color 🙁 I am not in Florida, but wonder where I can find your Valspar colors. That is strange… maybe they've discontinued it? I bought mine at Lowe's. Great job! Quick question – were the walls textured? I'm considering doing this in a powder room, but am afraid that the wall texture will reveal itself as drywall, instead of board (as in board and batten). 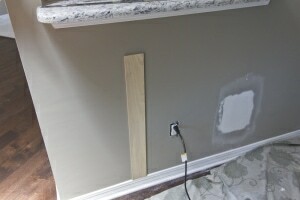 I could put up a thin board, but then my baseboards wouldn't line up right. Could I sand the texture off? Thoughts? I have been wanting to do this forever! Came across this post yesterday, was inspired and dragged my husband to HD and bought the supplies. Our dining room is much larger so it was about 130 bucks, still need a few more posts( have to go to another HD today) . Hubster is starting after work today. Soooo very excited. Your pics and step by steps were awesome. Thanks!!!!!!! Do you use glossy paint for the trim/wall? Or semi-gloss? We used a semigloss, but you could probably go either way. We bought our new house about 2 months ago… finally got around to removing the hideous wallpaper in the half bath (SO glad that's the only room with wallpaper! ), and wanted to find something to make it a little more exciting than just paint… love the look of this! (and seems easy enough) now just have to convince my husband… or I could just go get the materials myself 😉 (I spent all of preschool at home depot yesterday) I also want to do something in the dining room too! Thanks for sharing! Lovely home! Great choices on color. I am not a blue fan, so I will try greens, oranges, and browns with these paint colors. Hopefully it will look as good. What finish of paint (satin ?) did you use in the foyer? I'm thinking of doing mine in this color. 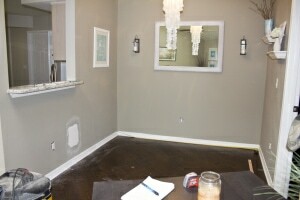 Semi-gloss for both projects! You can probably get away with satin but it won't be quite as easy to wipe down. 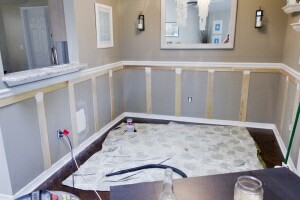 I have read several tutorials tonight on DIY wainscoting- and this is by far the best! I do have one question… what advice or direction can you provide for the corners? Just 45 degree angles? Thanks and it looks great! Sorry for taking so long to get back! Yep, 45 degrees on all the corners! This looks beautiful! I can't wait to try it out in my dining room! 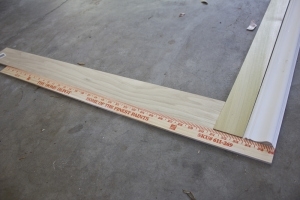 Question, do the vertical poplar boards stick out further from the wall than the existing trim around the floor? Nope! 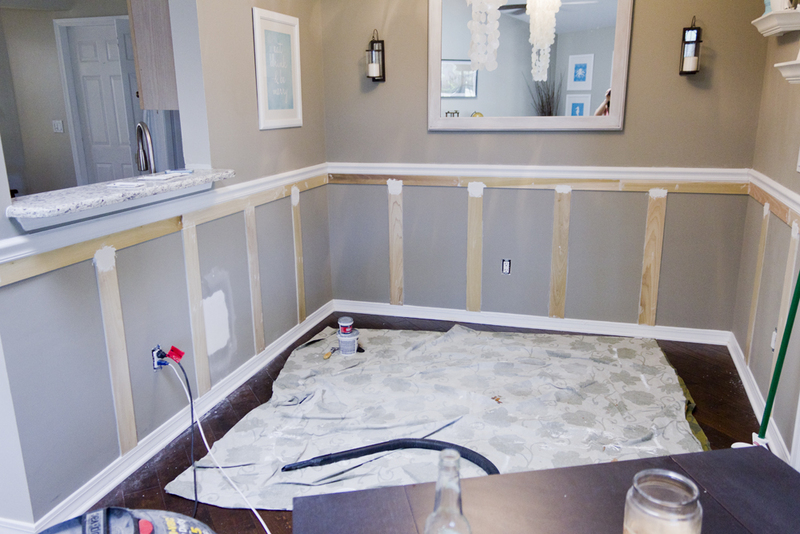 They are only 1/4″ thick and we went with them because they sat flush against the baseboards. Hey Jenna Sue! Just wanted to thank you for all of your inspiring and very helpful tips! We too live in Jax, (good ole' military) and i have been to your website many times, trying to talk myself into trying some of your projects! For the past few weeks, I have been looking very intently at your board and batten/faux wainscoting tutorials, and one day i think i can do it, and then the next day i scare myself out of it. So, this time i think i am gonna take that leap and just do it……so my question for you is, which way was more budget friendly? the poplar boards, paint, and trim (or chair rail?? ), or the beadboard way in your new office? and which way would you suggest for each getting them to stick up there on the wall? Liquid nail for beadboard?? nail gun for the poplar, correct? I know i want something in both our front foyer and dining room, i just need to get moving on it and make a decision already! So, thank you again for all of your helpful step by steps, and any tips or advice is greatly appreciated!!! Hi Jen! I can't remember the exact costs for each, but I would have to say the board and batten cost less because there's less material. 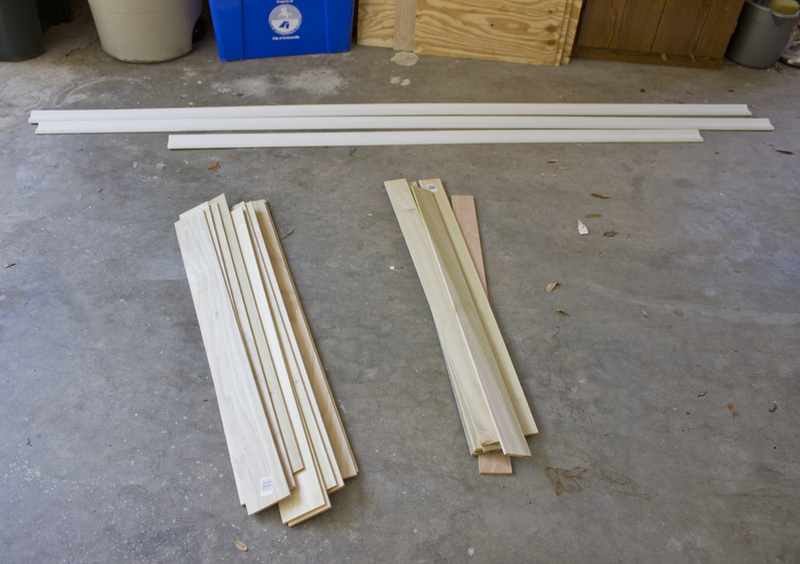 The horizontal pieces could be the same depending on what you decide to use, but you only need a handful of strips/wood pieces for the verticals which can be quite cheap depending on what you use. 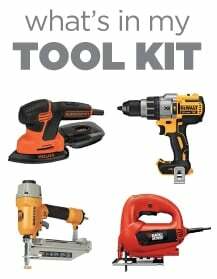 You would want to use both liquid nails and a nail gun for the beadboard, and you can get away with just a nail gun for the board & batten (if you are just using the vertical 'battens' like I did and not boards to cover your walls). It's a pretty similar process, so In the end I would just go with whatever you think looks and fits your space best! Hope this helps! Great! Thank you so much! 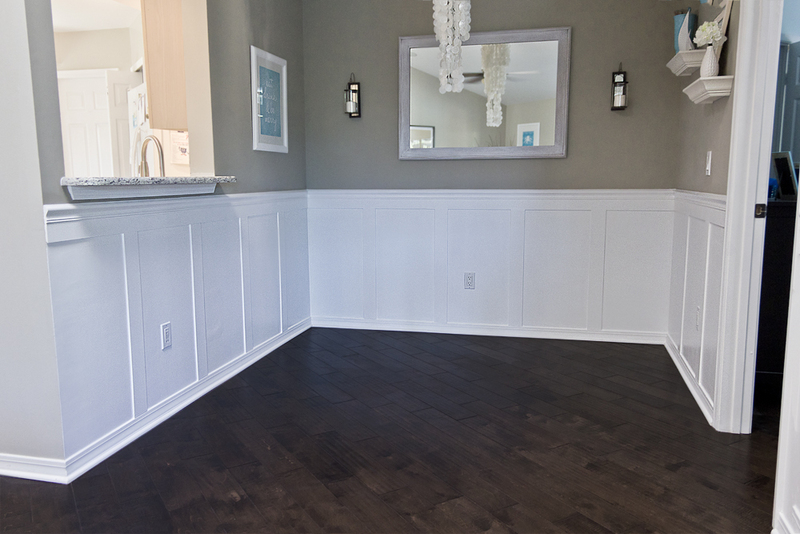 One last question….have you ever done beadboard wallpaper to kitchen cabinets? This is yet another task within this house that i want to tackle, but again…its finding time, and courage to do such a big job! Any advice on this? 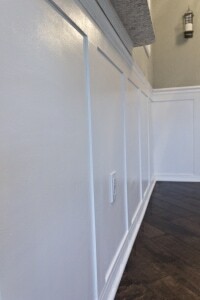 Looks nice, like this good use of faux wainscoting! I think it was just off the shelf untinted white! 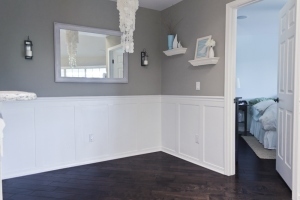 Beadboard also varies in size and thickness. The common widths recommended in the past for good workmanship were 3 and 4 (showing 2 1/4 and 3 1/4 on the face). Nominal thickness ranged from 3/4 to 5/8 to 1/2 and as thin as 3/8 depending upon the manufacturer. 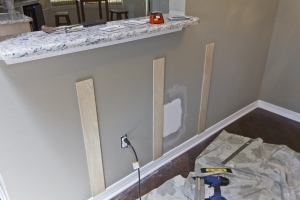 Did you nail the boards to studs or just into the drywall? 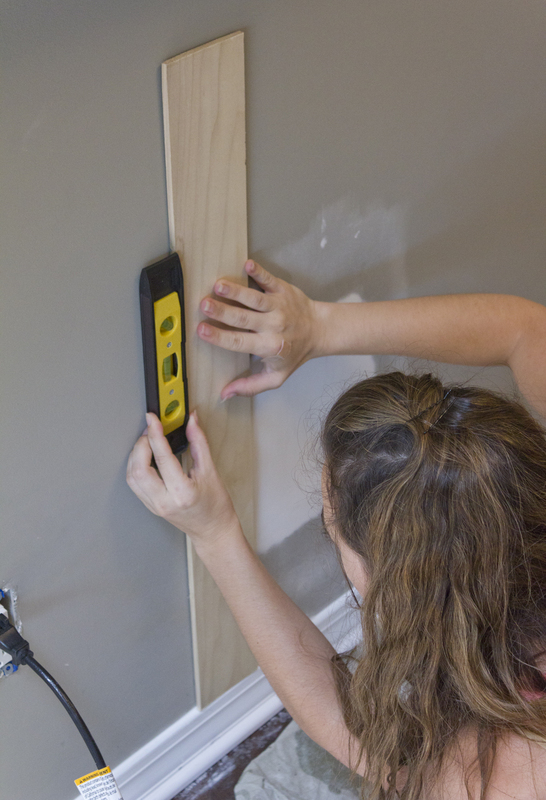 Would Liquid Nails work instead of nailing when applying to drywall? 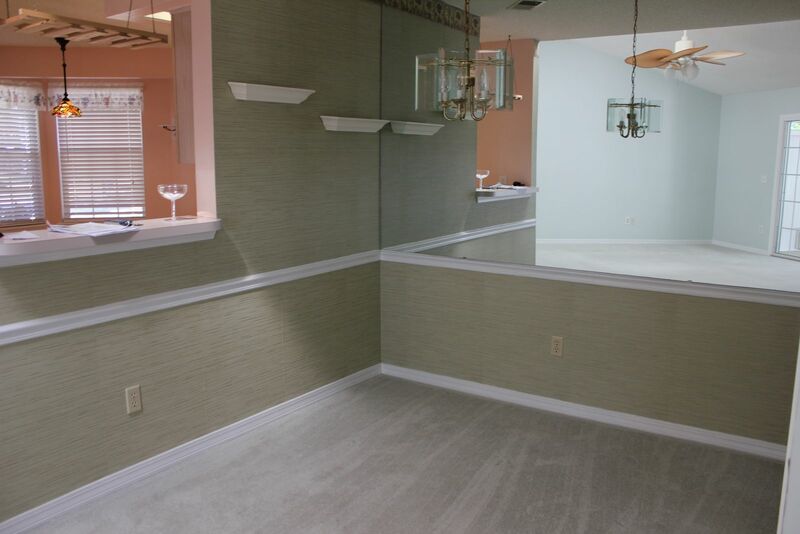 Hi Gail, I think in this room it was just the drywall but it was so long ago I cant remember! You definitely want to attach to the studs if possible. 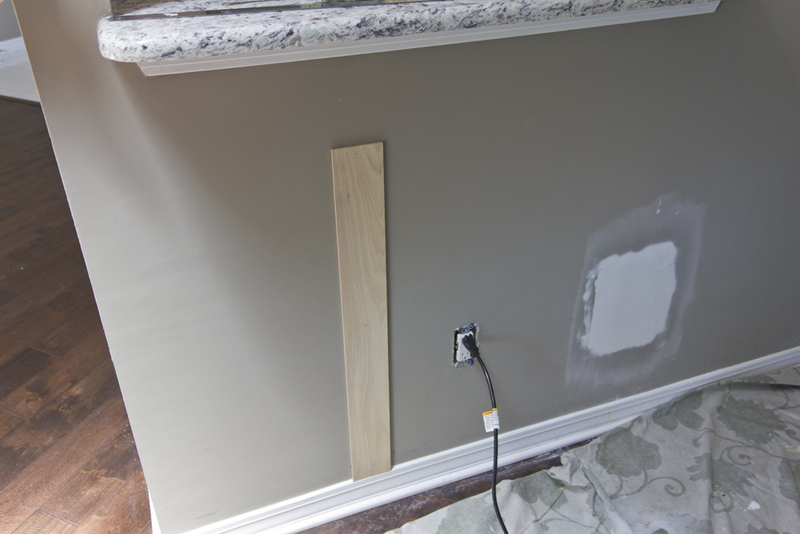 The drywall should pull the board to it but it won’t be super secure, which doesn’t always matter but if there’s a stubborn area where the board needs to bend a bit then nailing into a stud is the way to go. Liquid nails won’t do anything until it dries but it’s not needed at that point. Good luck! May be a dumb question, but did you sand the poplar boards, or did you just have to sand where you speckled and filled in holes? Also just curious what grit paper you used either way. Thanks so much for this tutorial. We will be starting very soon! Just where the holes were patched since the boards are smooth. I’d use 120 grit before painting. Hope this helps!